Goldston also told staffers that the network was conducting a "full review" of the error and its aftermath. Ross had initially reported Friday morning that Flynn was prepared to testify that Donald Trump as a candidate had instructed him to reach out to the Russians. Ross said more than seven hours later on "World News Tonight" that his information was actually that Flynn was prepared to testify Trump made the request as president-elect. On Saturday evening, ABC News said Ross had been suspended for four weeks without pay for what it termed the "serious error." During ABC News' morning editorial call Monday, audio of which was obtained by CNN, Goldston excoriated his staff for the error. "I don't think ever in my career have I felt more rage and disappointment and frustration that I felt through this weekend and through the last half of Friday," Goldston said. "I don't even know how many times we've talked about this, how many times we have talked about the need to get it right," he added. "That how we have to be right and not first. About how in this particular moment, with the stakes as high as these stakes are right now, we cannot afford to get it wrong." CNN provided the quotes from the recording included in this article to an ABC News spokesperson, who did not deny that they were authentic. The spokesperson declined to comment beyond Goldston's remarks. Goldston noted that ABC News "spent this weekend getting absolutely pilloried as a news division for reporting fake news." "250,000 tweets. One percent positive, 99 percent negative about this news division. Two tweets from the president," he told staff. Goldston also said, "If it isn't obvious to everyone in this news division, we have taken a huge hit and we have made the job of every single person in this news division harder as a result. It's much, much harder. We have people in Washington who are going to bear the brunt of this today and in the days forward. Very, very, very, very unfortunate. Really, really angry about it." 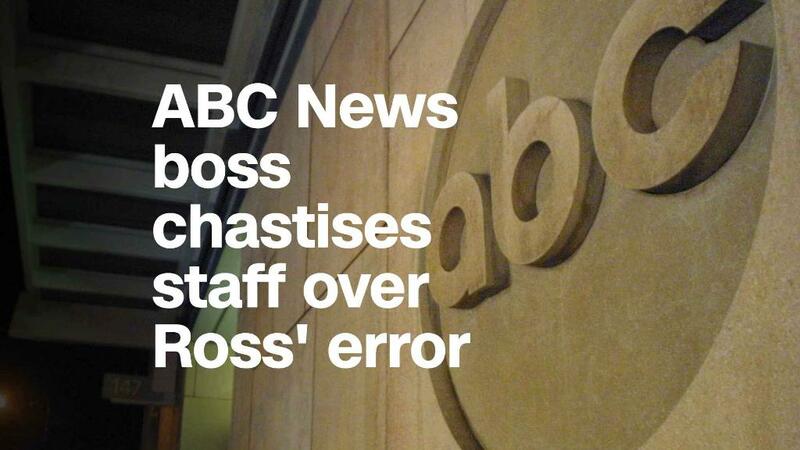 The ABC News chief said that Ross reported information that was "just plain wrong," and did so without anyone "having ever made a decision that we were going to go to air with that information." "We just went on air with that information," he said. "We hadn't approved doing that. And the thing that just kills me about this is all we had to do was wait. We had to wait a few minutes. A few minutes after that, the charging documents came out. We know that those charging documents had come out, and we had looked to those charging documents, and the charging documents didn't match what we thought the story was. We would have not gone with that story." Goldston expressed additional frustration at the fact that it took more than seven hours for ABC News to clarify the story on ABC's "World News Tonight." Later, Friday evening, the network issued a full blown correction in a written statement. "The thing that compounded our mistake is that not only did we make a mistake, if we had then corrected ourselves right away, again -- we wouldn't be in this position. It would have been a very different story," he said. "But we ended up in the impossible situation where we had actually conflicting information that we said on air, which conflicted with the information that was online. And then it took us seven hours, eight hours to get our story straight. This is not acceptable. It's not acceptable. And we will all pay the price for a long time." Multiple ABC News employees, who spoke on the condition of anonymity because they weren't authorized to publicly discuss the issue, told CNN there is widespread discussion about Ross' credibility moving forward. "No one wants to work with him," said one ABC News employee. "The future doesn't seem bright for him," added another. ABC News employees have also told CNN that there is great internal embarrassment over the blunder. Goldston himself also said during the call that Ross' credibility, and ABC News', had been damaged. Goldston has been the president of ABC News for the past three and a half years. A native of Britain, he was a producer at the BBC and executive producer of ITV programs before joining ABC in 2004. His anger on the morning call reflected a weekend's worth of criticism of the news division, which is owned by The Walt Disney Company. On Sunday's "Reliable Sources" on CNN, political analyst Jeff Greenfield said ABC had made a very "consequential" error, especially given the current political climate. "This is exactly what Trump and his allies want to say: 'No matter what you hear on mainstream media, it's fake. They're doing it to hurt us.' And this is like handing a sword to the people who want all media to be looked at in that regard," Greenfield said. On Saturday night, Trump tweeted his "congratulations" to ABC for suspending Ross. The next morning, he ramped up his language, tweeting that "people who lost money when the stock market went down 350 points" after Ross' reporting "should consider hiring a lawyer and suing ABC." Not all of Friday morning's losses were attributable to the ABC report, and by the closing bell, the market had mostly recovered.